Together with NATS and Banks Renewables, Glasgow Airport has introduced a new radar earlier that can mitigate the impact of the Kype Muir Wind Farm near Strathaven, South Lanarkshire. The development will generate 88.4MW of renewable energy from its 26 turbines. NATS will manage the dual Terma SCANTER 4002 radar system, which is capable of supporting air traffic control requirements and mitigating the impact of the turbines. The system is now operational and NATS has secured the contract to operate and maintain the service for the 25-year life of the wind farm. 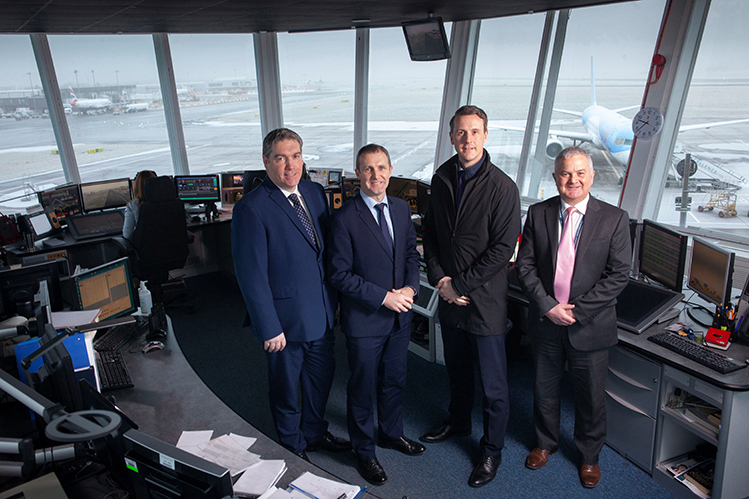 Andrew Liddell, Technical Director at Banks Group; Cabinet Secretary Michael Matheson; Glasgow Airport Managing Director Mark Johnston; and Paul Beat, General Manager, NATS Glasgow. Due to their height and movement patterns, wind turbines can have a range of impacts on navigational systems, including being detected by Primary Surveillance Radar (PSR) and appearing on air traffic control screens. This can have a number of impacts, including distracting controllers, masking ‘real’ aircraft and mimicking the appearance of actual aircraft to the extent that they must be avoided by other aircraft. Such impacts can be detrimental to the safety, efficiency and capacity of the airspace surrounding airports. As a statutory consultee, Glasgow Airport must assess wind farm development proposals up to 50km away. Importantly, it must ensure any proposed development will not pose a risk to the safety of the 30 airlines who fly over nine million passengers to and from the airport every year.